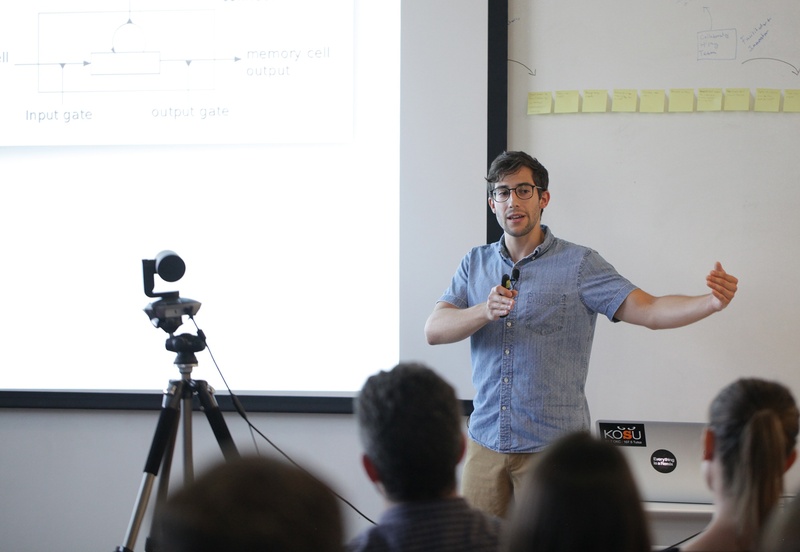 July 19, 2018 - Exaptive data scientist Austin Schwinn presented his solution to predict dengue fever outbreaks using machine learning. The solution was entered into a global contest last year. DengAI: Predicting Disease Spread was organized by DrivenData.org. Entrants like Austin had to research the life cycle and habitat information for the Aedes aegypti mosquito, the predominant carrier of the viruses that cause dengue fever. The contest provided historical climate data from Puerto Rico and Peru. Contestants then used machine learning to predict the number of dengue cases by modeling when the mosquitoes were most likely to flourish as the weather changed. Austin submitted his solution during his first year of grad school. He was pleasantly surprised when judges ranked his solution in the top third of all submissions. Austin successfully defended his graduate thesis to complete his Master’s in Machine Learning and Data Mining this year. To see more pictures from the meetup, check out our Facebook page. Make sure to join us for the next Data+Creativity Meetup. We’re excited to have Just Enough Software Architecture author, George Fairbanks, as our guest in August!